As we move into March suddenly there are choices to make as to what to feature in a Monday vase. Vying for attention this week are anemone coronaria, hellebores and camellias, all fine and worthy candidates; however, looking toward spring, Narcissus is my spring sentinel and sentimental favorite. Bright yellow drifts of color are forming around the neighborhood and beyond as cheerful daffodil blossoms appear. I gathered a couple dozen King Alfred daffodils Saturday, conditioned them in water overnight and fashioned them into a simple bouquet on Sunday. As an accent a leaf from a Warneckii ‘Lemon Lime’ houseplant was wrapped around the upper stems. The bouquet sits in a cube of glass held in place by a metal floral pin or frog. Decorative green stones hide the frog and visually help to anchor the flowers. I photographed the design in several settings. An extra flower laid across one corner of the vase was the final touch needed to break up the space and unite top and bottom. This entry was posted in garden and tagged flower arranging, flower design, in a vase on monday, Narcissus 'King Alfred', nature photography on March 7, 2016 by pbmgarden. Susie this is really imaginative and creative, I just plonk my dafffs in a jug but really love the use of the wrapping leaf and whole composition. Nothing lovelier than daffodils in a jug Julie, but this design was fun and quick. My warneckii is never going to get anywhere if I keep taking its leaves but I couldn’t find ribbon. Wow, you’ve taken daffodils to another level. I hope that I remember this next year when I have some Narcissus again. This is really the very best I’ve seen! Thanks, happy you like them. I found some inspirations, took ideas from several, then tried to make them work with what I had on hand. I’m pretty satisfied with the way it turned out. Maybe something similar would work for your beautiful array of tulips? Yes except tulips have more of a tendency to bend their stems. Does that ever say Spring! And I love the other greens with the leaves and pebbles. It’s also nice to have an arrangement that emphasizes the verticality of those daffs. Thank you Linda. It is nice to emphasize those long stems. A garden club speaker once told us to reach down as close to the ground as possible and snap off the daffodil stem at the base as if you were snapping a green bean. 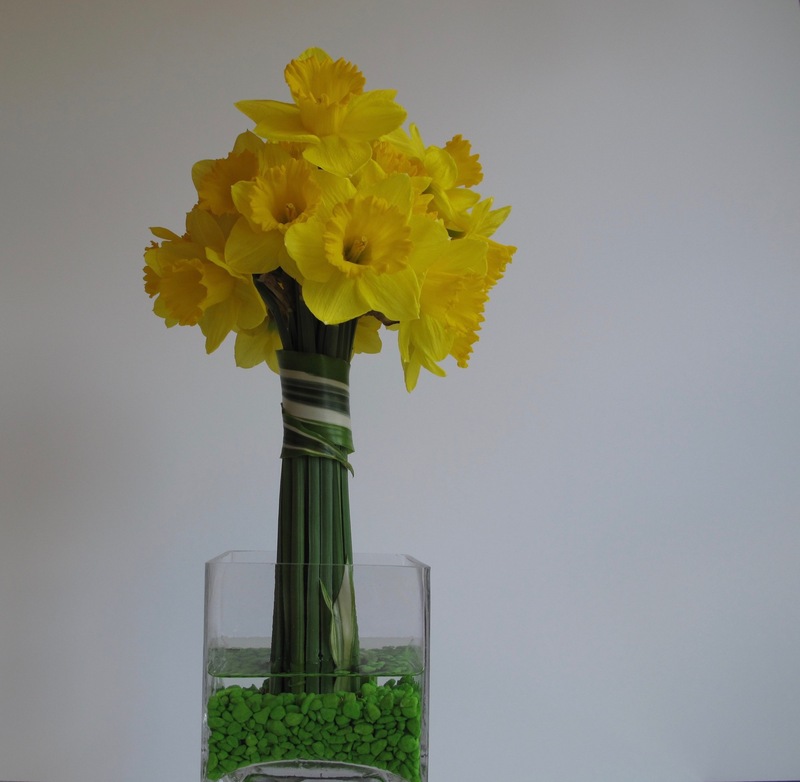 Your cylindrical vase sounds perfect for daffodils Cathy. I have two vases that are my fall-back ones for daffodils but didn’t want to repeat. This was easy to make but might not have tried it without IAVOM. I thank you for hosting. Thanks Anca. I enjoyed putting it together. Fun to try something different. Once again you’ve turned simple (but beautiful!) flowers into a decorative masterpiece, Susie. Wrapping the stems with the dracaena leaf is genius! Wow, thanks Kris! That dracaena is a couple of years old with only 3 leaves. I keep using them for arrangements. I love it – so artistic and stylish. I think we’ll all be trying this instead of plonking our daffodils in a jug on the kitchen table! Thanks. 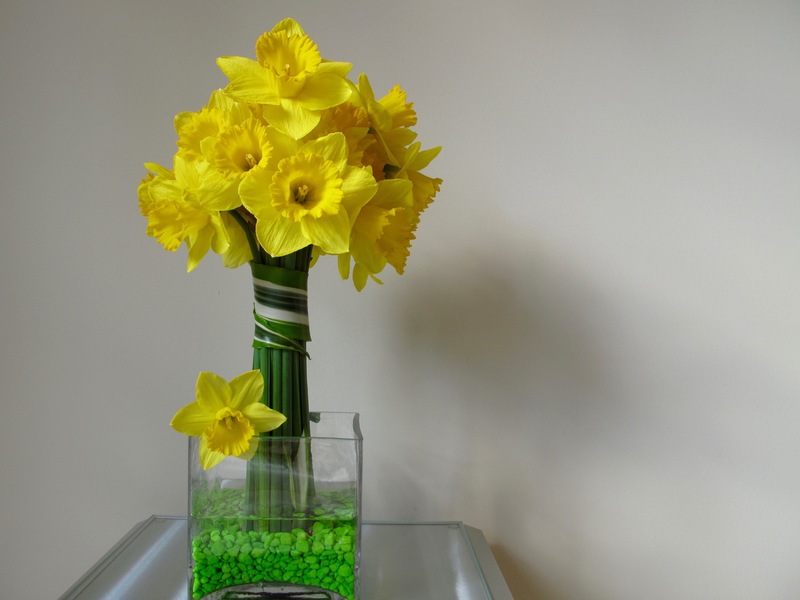 This was a lot of fun to try, but I admit I really love a jug of daffodils any time! Your daffodil border must be a wonderful sight Julie. King Alfreds make a strong statement in the garden. I told my husband today I’m planting more daffodils next fall. Thanks Malc! I wanted to do something “modern” with daffodils today! Thanks so much! Decided to go for a contemporary feel using old-fashioned flowers. You have obviously wowed us all with the clever bundling of the daffys and the extra single is the perfect touch to bring it all together. Filing this one away for future reference. Thanks Ricki. Do give it a try–you’ll find it goes together quickly. 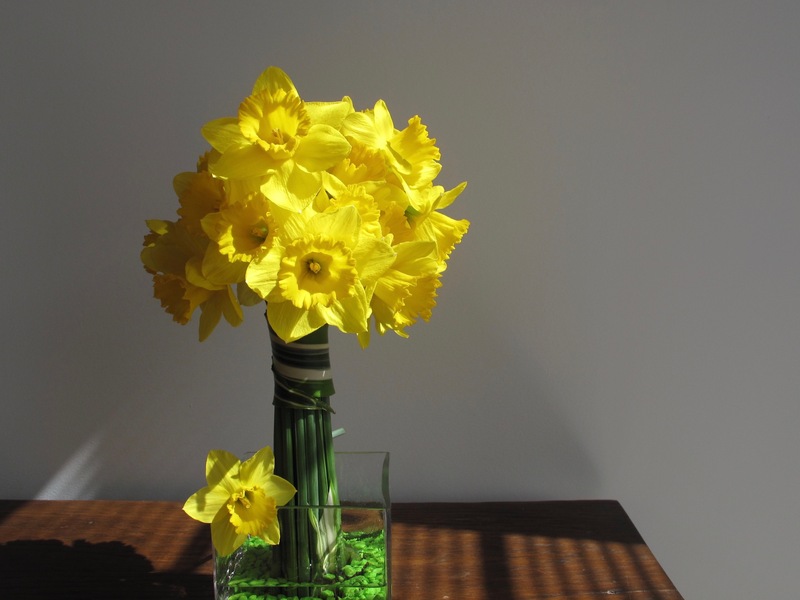 I love how daffodils can brighten a room or a town. Thank you so much Cathy. I am so happy to have the sun shine on the daffodils. It was a long, rainy autumn and winter. Placing that flower was a fluke but seeing it revealed something to me about the design I hadn’t noticed before. Have a great week. Thanks Judy! I sometimes obsess a bit too much about what to use for a Monday vase, but it’s fun. Lovely, like a soft Narcissus explosion. Sounds like the best kind of explosion ever. 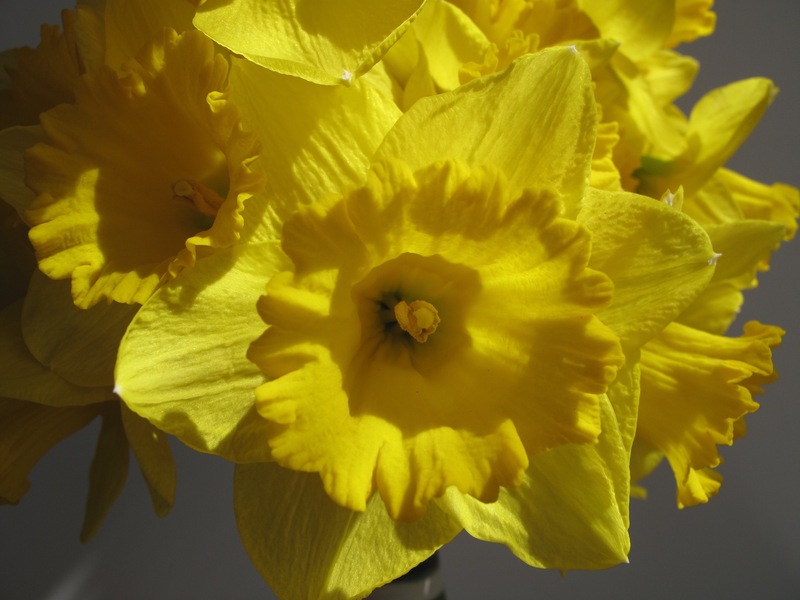 I do think King Alfred is my favorite daffodil: nothing else quite compares! Your arrangement is stunning in its simplicity. Thanks for visiting me…I’m looking forward to the CH Garden Tour and to being a docent! Hope to see you soon. Thanks Libby. King Alfred is reliable and bright. I keep spreading it around more. A great way to display daffodils Susie. They look wonderful. Thank you. They have been wonderful to enjoy all week. So lovely! They really say spring and sunshine are finally here. I love the first photo so much; the way the light drapes on the arrangement is so perfect. We’ve been in the high seventies this week and the daffodils are icing on the cake. Thanks for the comment about the photo. Lighting is something I have a hard time figuring out. Wow I am glad I didn’t miss this vase…it is a masterpiece in beauty! Thank you Donna. It lasted almost a week. Just took it apart this morning and picked out all those little green stones from the floral pins–what a chore.